Popeye is one of the world's longest-running comic characters, and originally started life in 1929 - the same year as the infamous Wall Street Crash. His popularity has remained high even since, with TV shows, live-action movies and - of course - video games all bearing his name. As the world prepares itself for yet another stab at turning the famous sailor into a cinematic triumph, Slopes Game Room has put together this exhaustive video which details the character's previous gaming exploits. Of particular interest here is the Nintendo-made Popeye games. Popeye and Nintendo have a long history, with the Kyoto company finding success with playing cards bearing the sailor's likeness. Later, Nintendo wanted to create a Popeye arcade game but failed to secure the licence - that game would become Donkey Kong, the first title to feature Mario. Had Nintendo been successful in securing the Popeye brand, gaming history might have been very different. Following the commercial success of Donkey Kong Nintendo was finally able to make a Popeye game, and this was subsequently ported to practically every platform of the period. 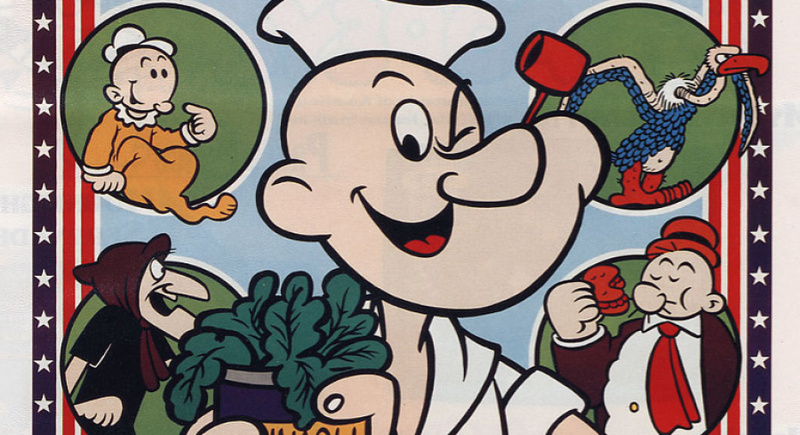 Game & Watch titles also appeared, cementing Nintendo's association with the spinach-loving hero. However, what's less well known is Popeye's gaming history beyond this point - so if you want to find out how the sailor did in his post-Nintendo period, give the following video a watch. I have Popeye in the Atari 2600 and 5"25 floppy. It's a great game. I also used to like the cartoon. I have since bought 2 dvds of Popeye. I think if a new Popeye game was made it would be overly complicated. Do you know of a place where sailors hang out? The one for the game boy looks SUSPICIOUSLY like Super Mario Land! Whoa, this one jogged my memory a bit. I knew someone in my old neighborhood that had a Popeye arcade machine back when I was about 7 or 8 years old... so 1987 or 1988. Not sure what his parents did for a living, but i thought it was amazing at the time that they had an arcade game in their basement, which happened to be Popeye. That may have very well been my first electronic gaming experience, with exception to the TI Home computer and all its cartridges, and the occasional arcade game I'd get to play in public areas. And those Apple IIc learning games you could play on the classroom computer. I was never a fan of the Popeye cartoons, some of the games weren't bad though. Then there was that awful movie. Wow! I love Popeye (got into the comics because of the newer "classics" reprint series), but have only read longingly about these games. Would be cool to see a revival for the eShop! It was the C64 version for me. I never played (and still have never played) the NES or arcade versions. But the big chunky sprites were cool at the time, even though the game was utterly bizarre with UFOs and giant wasps and the like. Though Trap Door used the same 'engine' as Popeye and was the better game. And hey, the video even has a link at the end to a discussion of Driv3r, a game I worked on. Fun times. Bought the Famicom game a month ago. Haven't played it much, but seems fun (and the music is good). @Damo, I get that the CGI Popeye doesn't feature the pipe, spinach and tattoos (at least according to the teaser), but let's get real - Genndy Tartakovsky was the guy at the start of the video. As in, Genndy "Samurai Jack" Tartakovsky, the same mind behind Dexter's Laboratory and (partially) The Powerpuff Girls. The guy's a legend in the animation field, and rightfully so. Too bad the project seems to have come to a screeching half as of now: CGI hate aside, the footage seemed promising in its own right. As for the game, well, I already know the history behind the transition - Bluto became Donkey Kong, Popeye became Jumpman, and Olive Oyl became Pauline. I have very fond memories of playing the Popeye game on my C64: I still can't get its BGM out of my head twenty years later. Which means all of you have to share my same fate. The last version of the arcade game Popeye I have is on the Atari 5200! Cmon Nintendo spend the money and get it in the Wii U vc!!! I remember having this game on NES. I was so young. I guess Popeye is confirmed for the next Smash game lol. I'd say that I'd love the replay the old classic atari popeye game, and even see a new one, but I fear that many of the younger generations don't even know who he is anymore. This seems to be the case with many classic cartoons (with the exception of Scooby Doo, Smurfs, the Chipmunks and Looney Tunes). Seems the classics are being forgotten about (Woody Woodpecker, Chilly Willy, Wacky Racers, Captain Caveman, Grape Ape and more). Somewhere, there's got to be a creator that wants all of these characters to make a come back! I love the Popeye cartoons and I've read some of the comics,I'm still yet to watch the movies though. Ok so Pop Eye is Mario, instead of spinach we got mushroom and Pluto is a gorilla? @Nintendian I would equate the spinach rather to the hammer in Donkey Kong. The Mushroom Kingdom was still a couple years away at the time. And a minor correction- it's Bluto (aka Brutus), not Pluto.